Welcome to my Etsy Jewelry Store. I love beads and love the "bead hunt". I adore bringing back to life rediscovered beads into my jewelry designs. Vintage Venetian glass beads being some of my very favorite beads to work into my pieces. I often incorporate new accents beads into my work, such as freshwater pearls, natural stone beads and crystal beads. As the result of avidly collecting beads for over 25 years, my selection of beads to work with is vast (to say the least); resulting in many One-Of-A-Kind pieces. My customers often describe my work as feminine and delicate. I'm thrilled to own another pair of beautiful earrings made by Susan Luce. The unusual beads she uses make for unique pieces. They are packaged beautifully and shipped promptly. These earring are beautiful. Lightweight. Came exactly as shown. Packaged very well for shipping. A thoughtful thank you note and a little gift was included by Susan. Absolutely gorgeous. Lightweight. Came very well packaged for shipping. A little thank you note and a nice little gift was included from Susan. 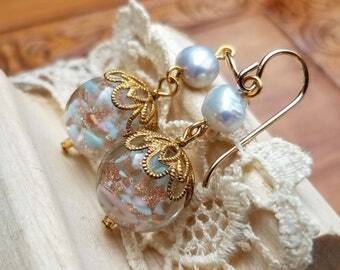 Very lovely earrings. Light weight. Exactly as shown. Came very timely and well packaged for shipping. A nice card and thoughtful little gift was included by Susan. These are a perfectly delicate addition to my collection of Luce Creations. They arrived quickly and were creatively packaged, a joy to receive! I started my shop in 2009 after a close friend of mine (a seasoned Etsy seller) gave me a push to join this fast moving, inspiring website known today as Etsy. My friend and I together shared vendor spaces at Street Fairs all over Manhattan in the 90's, prior to becoming Etsy sellers. Over a 13 year period living in NYC, I was a "regular" at the Chelsea Flea Markets searching to uncover vintage beads or necklaces that I could take apart and bring the beads back to their glory in my handmade jewelry pieces. What developed from all of those vintage beads I collected over time, was a line of jewelry that is feminine and delicate, and at time whimsical. 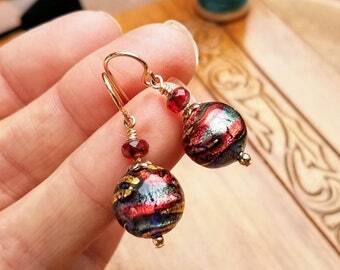 In the 90's I made my way to Venice, Italy where I fell in-love with Venetian glass beads. I think the bead collection I purchased on the island of Murano weighed more than my original luggage for my trip over to Italy (that might be a slight exaggeration, or was it merely wishful thinking?) I have been designing jewelry from Venetian glass beads since that trip. Leading up to today...Many, many craft shows, here in Vermont (where I reside now) and many, many one-of-a-kind pieces deigned from my vast collection of beads. And still through it all, I love what I do and hope to continue for many years to come. My studio, which is the top floor of my house, is what "calls" me out of slumber each morning. The sun streaming in through the skylights, my cat and 2 dogs keeping a watchful eye on me, VPR on the radio, surrounded by beads and possibility...it's the closest thing to heaven that I can think of. Welcome to my Etsy Jewelry shop. Here you will find jewelry designed and made by me. Whenever possible I like to use vintage beads in my creations. I like combining these vintage beads with the very best beads of the present. Many pieces will be One-Of-A-Kind. When you purchase from my shop you will receive your pieces uniquely packaged and tucked into a complimentary gift box, ready to give as gift or to keep for your very own self. It is my goal to have satisfied buyers; I want you to feel happy about your experience shopping in my Etsy store. If you are unhappy with your purchase or your item arrives damaged, let me know as soon as possible and I will do what I can to make it right. If I can make the same piece again (not always possible with vintage beads), I will. If I can't replace your item, I will refund your purchase through PayPal, or by check (if you made your purchase by check). I accept payment through PayPal and Personal checks. Orders through PayPal will be shipped out within 1-2 business days of receipt. For Personal checks, I will ship your order out within 1-2 business days of check clearing through the bank. I generally ship using First class mail. If you need your order quicker, I am happy to upgrade to Priority Mail for an extra 3-6 dollars, depending size and weight of package. For more details, feel free to send me a Convo.